At Rome's Cat Sanctuary, the chef's comments have raised eyebrows among the volunteers. Rome, Italy (CNN) -- Italy's state-owned television broadcaster has dropped a popular chef for sharing a recipe with viewers to cook cat. Beppe Bigazzi told CNN that while he would miss collaborating with the RAI-Uno TV network, he would not apologize for his comments because they reflected historical facts, not just his opinion. He blamed the furor on animal rights activists saying "It's their problem, not mine!" During a live broadcast February 10, the grandfatherly Italian cooking expert noted that in decades past, Italians in the region of Tuscany did eat cat meat. Bigazzi, 77, told viewers there was a saying for this time of year that "if you don't have meat, kill the cat." The popular TV chef then went on to describe how you can tenderize the meat by letting it soak for three days in running spring water. As Chef Beppe continued, his co-host of 'La Prova del Cuco,' Elisa Isoardi looked aghast. The young hostess declared "My Othello in a stew? No!" Othello is the name of her pet cat. But Beppe wasn't finished. He told viewers he had dined on cat many times and that the meat tasted better than chicken or rabbit. By this point, Isoardi was trying to hide behind a cart filled with vegetables. Management at RAI-Uno suspended him immediately. The chef said he has since been told he will not be appearing on the show again. Carla Rocchi, President of Italy's Animal Protection Association, said: "The truth is that Bigazzi only wanted this: his moment of fame. He is getting it, but in a negative way." There were indications during the TV broadcast that Chef Beppe knew animal rights activists would respond. He mentioned that while they would be upset, they were wrong to think animals like cats were any different from rabbits that are sold in Italian shops. Interviewed at his apartment in Rome, Bigazzi told CNN: "It was a custom [to eat cat] all over Italy." "In Parmas the cat was nicknamed 'the rabbit that runs on roofs,' in Liguria, the cat is nicknamed 'the rabbit with short ears, in Piemento it is called the 'rabbit that meows.' Today we are scandalized by this. Why? Because times have changed. The cat has become a domestic animal. This was not the case before." Bigazzi says that his father was imprisoned by the Russians and his farm family scraped by on what they could during the war. "The chickens were for selling," he said. "The rabbits were for selling. The cat was more difficult to sell, so we ate cat. I have no shame of it." Rocchi responded: "Today, what is the point of talking about eating a cat, especially since it is prohibited by law?" An American volunteer at the famous Cat Sanctuary in the ruins of Torre Argentina in Rome said the debate over Chef Beppe's comments may come to some good. Andy DiPaula told CNN: "I think the real question which has been raised in a lot of people's minds is, after all, if cats, why not rabbits, why not lambs, why not protect them as well?" The Cat Sanctuary is now something of a tourist attraction. About 200 feral cats roam the ruins where Julius Caesar was said to have been assassinated in Ancient Rome. The cats get food, shelter and veterinary care funded by public donations. The number of feral cats in Rome has declined after a concerted effort to sterilize the animals that were suffering due to over-population. 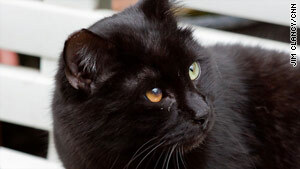 Rome's cats at the sanctuary can be adopted by the public. "But not to anyone," quipped DiPaula, "who arrives here with a cooking pan."